Since the launch of the Social Inbox, inbound marketers everywhere have had a much easier time publishing and monitoring their social media content. 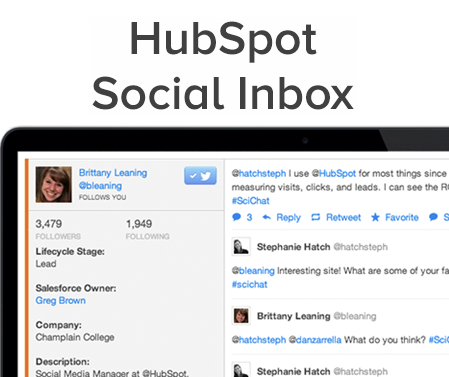 The tool is worth the hype; we've realized so much return from our time using the Social Inbox, that we wanted to share our favorite features with you. You never have to leave the tool. With Social Inbox you will be able to see all of your contacts’ interactions in one place, continue to expand your contact profiles, and be able to spend more time focusing on helping your clients meet their goals. 2. Quantify the ROI of your social media leads. Just like any other aspect of marketing, the more meaningful data that you have the more you can tailor your strategies accordingly. With the new analytics feature of Social Inbox we can monitor, clicks, comments, and retweets easily and see just how your social media affects to your bottom line. If you’ve used HubSpot before you’re probably familiar with the “Recipes” feature, which helps you create workflows, conversion pages, etc. The recipes are actually the same workflows that the HubSpot team uses to segment or organize their own leads. These recipes are great resources and guidelines for our work, and we are excited that they’re expanding this with the release of Social Inbox. These recipes show you just how the folks at HubSpot are utilizing the social media tool themselves, and hopefully spark some new ideas for your own campaign from these recipes. 4. Map to lifecycle stage. The more context that we can give our social media managers and sales team before they approach a prospect or a new conversation with a customer the better. One of the greatest things about lead management integration with a prospects lifecycle stage, is that when you hand over a lead to the sales team, they can frame the conversation they have with that prospect accordingly be it over the phone or via email. Now, using Social Inbox you can carry over this process to social media as well, and be able to know, at a single glace, if that @ mention was from a customer or a sales qualified lead or even a new visitor. 5. Increases marketing automation abilities. Automated marketing is designed to make all our lives easier. We’ve already discussed all-in-one integration, but having the ability to move a social media lead immediately from a social interaction into a workflow is really exciting. Especially as it pertains to your lead nurturing and segmentation strategies, as this will allow you to authentically engage with each of your prospects on a social level. 6. Turn down the volume. Social media is booming, and between Facebook, LinkedIn, Twitter, email, and any other social platform you may be using, we all know how easy it is for a post, question, compliment, or complain to get lost in the noise. By being able to filter your Twitter feed in it’s very own stream, categorized by keyword, mentions, retweets, and even exact phrases, you’ll be able to easily see information that relates to current campaigns you’re working on, prospects you’re trying to engage with and customers you’re trying to retain. Social inbox enables you to track you social media to your marketing efforts by easily monitoring these ongoing conversations. 7. Return to the conversation. The goal with this feature is to get back to the heart of social media: the conversation. Social Inbox gives us the ability to not just push content out, but to actually engage in a conversation, whether that be with a customer, a prospect or an industry leader. You’re able to talk on a more personal level, educating your prospects, and enabling your clients help achieve their business goals. These are just the top seven features that excite us, but there is a plethora of other features that help our inbound process. Check it out!